In the last column I wrote how innovations in sensor technology are driving down the costs and increasing the availability of connected sensors. This has the potential of truly transforming the way small businesses, and supply chains, operate. And remember, the thought here is to highlight what any business can do–no waiting for the “big players” to implement something. As mentioned, the “internet of things” (IoT) is more than just having “smart” devices. There are many devices and appliances that have intelligence built into them. Take the iRobot’s line of products, including the Roomba. This is a robot that learns about your house and vacuums your floor. This is an “intelligent” device, but isn’t (at least not at this writing) connected to the outside world. 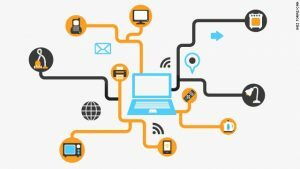 What makes the “internet of things” truly revolutionary is the connection of the device to the larger world through wifi, or bluetooth, or other connectivity approaches. How can small businesses begin to leverage these technologies? I propose that we begin to “think differently” about how we manage our businesses, and look to see what questions we have always wanted to have answered, but never seemed to have the data to answer the question. Sometimes answering the question would be too expensive, and as a friend would say “the juice isn’t worth the squeeze.” But often, if one could answer the question, it could lead to significant benefits and competitive advantage. For example, let’s consider a florist. Perhaps the most important and costly single expense for a florist is the walk in cooler. Properly controlled temperatures can extend the useful life of fresh-cut flowers significantly. In fact, the range of acceptable temperatures is actually quite narrow (ideally 33-35 degrees F.) The impacts of higher than normal temperatures lead to a higher respiration rate, and faster water consumption shortening the life of the cut flowers. customer dis-satisfaction from a significantly shorter life of the flowers and arrangement delivered. Imagine if the florist could exercise tighter control over the environmental controls–the longer lived flowers, coupled with the ability to offer a wider selection with greater life-spans of floral bouquets certainly could provide an advantage in business. Imagine a sensing system that once installed will notify the florist (by email, text, or even a robocall) when the temperature is “out of specification” for a set period of time, and during specific times. The system could be set to text the owner any time during non-business hours when the temperature is too warm or too cold. Perhaps this is an indication of a door left open, compressor failure, or a power outage–assuming the IoT system is on a battery backup. That could mean the difference between a significantly shortened life of the product or continued business success. But wait–there’s more! The coolers should also maintain a high relative humidity, in the range of 90-95%. a Hygrometer sensor can notify the owner when the humidity falls out of specifications. Now, perhaps the problem is simple–the door was left open and the cool (and damp) air has been escaping. Then a proximity sensor to detect the status of the door would be helpful allowing the owner to quickly assess the problem. On the other hand the problem could be more complicated, and could include a failure of the compressor motor. This is where this moves from simply interesting to being quite useful when sensors are applied in other locations as well. For instance, vibration and temperature sensors could be placed on the the cooling compressor motor. The data being provided by these sensors, combined with the performance measures of temperature and humidity, can provide insights into the health of the cooling system itself. The vibration sensor can not only track the operating of the compressor, but also the duration it is running and any change in the performance (increased vibrations, or decreased.) In this way, the sensor data can begin to track changes in performance before the potential catastrophic outcomes of poor temperature control. This example, while limited to one type of small business, serves to show the ways sensors can be used to monitor crucial aspects of a business that perhaps were unable to be closely monitored before, usually because of a lack of technology, or because of the high costs associated with implementing the technology. Both of the barriers to problem solving are disappearing quite quickly. Having sensors throughout the establishment reporting on the critical measurements in real-time can lead to significant dollar savings, potential improvements in product offerings, and avoidance of possible catastrophic events. A well designed dashboard integrating the measures, with appropriate heuristics in place to provide the “expert analysis” that traditional small business owners normally would be unable to perform, can really enhance their operations. But this is not the limit. Next issue we will explore what can happen when your data is “set free” and shared with others in your supply chain.